Take a chance at winning the prize of your dreams from this year’s great offerings. Tickets are just $1 each and are available from any Dragonheart member, from many of our festival paddlers, and at the festival. You can even fill in the ticket and return to a Dragonhearter to put in the bucket for you. And as soon as the last winner has been announced, we’ll take all of the remaining raffle tickets and do one last drawing for our Last Chance Prize: $200 cash! This raffle for a Concept2 Indoor Rower and Paddlesport Training System Paddling Adapter is run by the members of Dragonheart VT to benefit the Ron Morris Memorial Sunshine Fund, which supports paddlers trying out for the US National teams. Ron Morris was a beloved member of Dragonheart Vermont for four years before his passing in 2016 from an aggressive cancer. 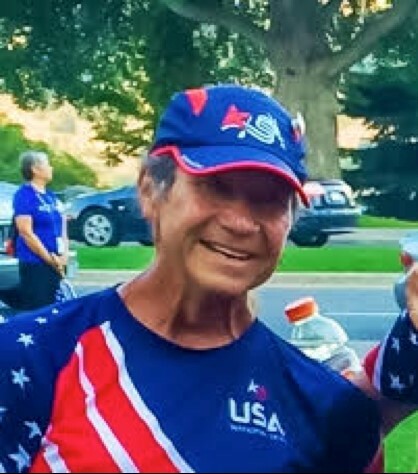 For those of us that knew Ron, we are blessed with the memory of his friendship, kindness and generosity, his quiet confidence, and his positive determination for a life well-lived. Learn more about Ron and the Sunshine Fund here. The raffle runs from 9 a.m. to 3 p.m. on site at the Festival. Tickets are $5 each or $20 for five. ** The Concept 2 will be shipped. The PSTS paddling adapter needs to be picked at the raffle on Festival Day. Festival racers and spectators can step up to try to get the fastest time in a 250-m sprint on a paddling ERG! The male and female paddler with the fastest times will be crowned the PSTS Paddling Champions! Learn how the Paddlesport Training Sport Adapter added to the Concept2 Indoor rower can be your best training partner. PLUS: Attention all paddlers! Want to become a better paddler? Mark McAndrew will talk about the benefits of a workout using the PSTS Paddling Adapter with their Concept 2 ERG for dragon boaters, stand up paddle boarders, and fitness aficionados. Mark is a longtime Concept2 employee and marathon canoe racer as well as co-owner of Paddlesport Training Systems. Head over to the Paddlesport Training Sport tent at Waterfront Park to learn more. 10am; 12pm; and 2pm. Contest: Runs from 9 a.m. to approximately 3:00 p.m. at the Festival Site. Races are $1 each. Cost: $1 per raffle ticket to win a paddle adapter which benefits the Festival cause, the programs of Dragonheart VT and Integrative Therapies at the UVM Cancer Center wellness programs. 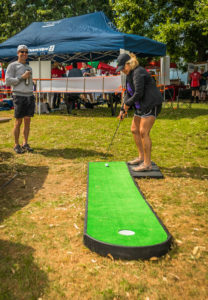 Festival racers and spectators can step up and take on a fun putting challenge to try to make a hole-in-one to support cancer survivors in our community! Each person who makes a hole-in-one will have his or her name placed in the pot for a chance to win our Grand Prize: A free Foursome with carts to Burlington Country Club, one of the top ranked golf courses in Vermont. Contest runs from 9 a.m. to 3:15 p.m. at the Festival Site. Putts are $1 each or $5 for six tries. Winners: Hole-in-one winners earn bragging rights, plus a chance to win the Grand Prize! Grand Prize Winner: Each hole-in-one champ will earn one chance inthe Grand Prize drawing. Around 3:15pm on Festival Day, a drawing will be held to select the winner of Green fees for 18 holes of golf for 4 people at Burlington County Club, a Vermont championship course, along with the use of 2 golf carts to make the play even more fun. Thank you to our In-Kind Donors: Burlington County Club and Gonzo’s. Come enjoy delicious Woodchuck Hard Cider under the big tent! 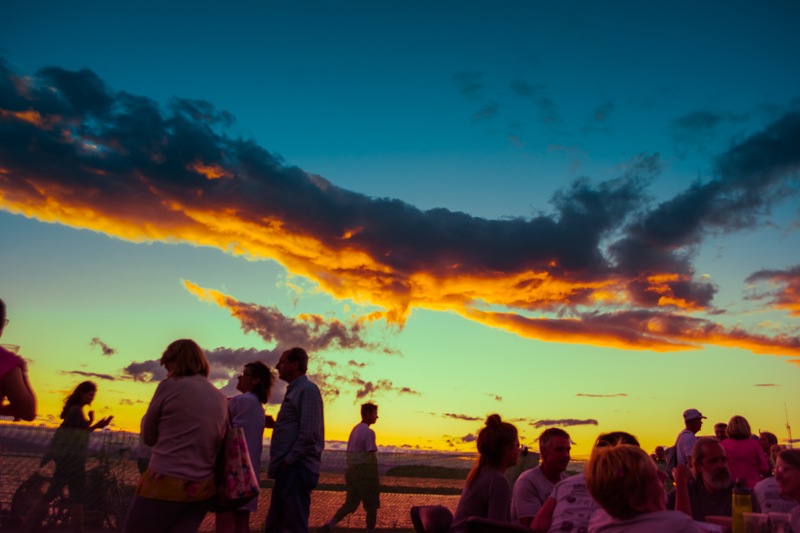 The Cider Garden will be open Saturday, August 4, from 5:00 – 9:00 p.m.with the X-Rays playing great rock and blues music which will get you out of your chairs and dancing. Festival participants wearing this year’s festival t-shirt are free to enter. For all other attendees, the cost is $5.00. Zero Gravity and 14th Star will return as beer sponsors for the Woodchuck tent. The tent will be open again on Sunday, August 5, from 12 – 4 p.m., and will feature several special Woodchuck Ciders, along with Zero Gravity and 14th Star beer, and wine offerings as well. You’ll also find amazing music at The Cider Garden: Local musician Zach Rhoads will be offering awesome entertainment! All entries are free on Sunday. Come on in, relax, enjoy a beverage, and listen to some tunes by the lake. 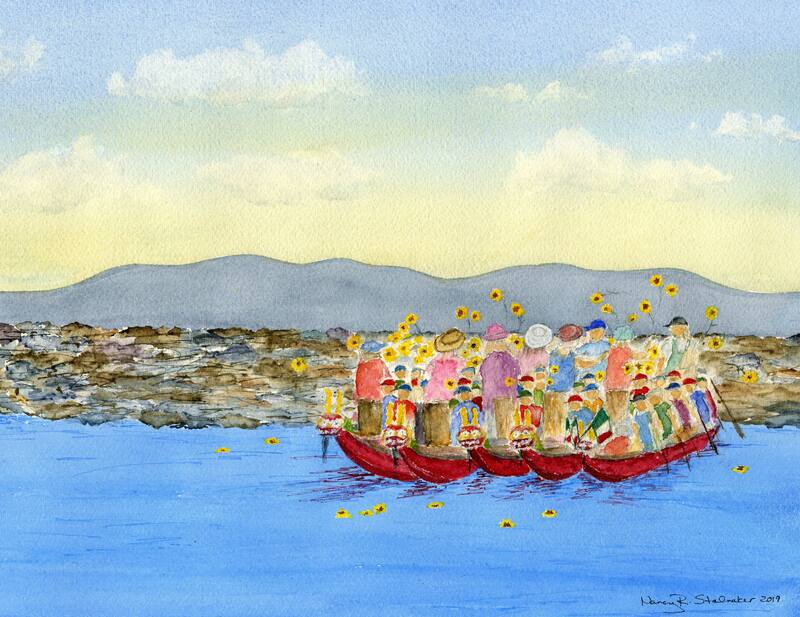 Each year, Dragonheart Vermont engages a local artist to create a print to depict the Lake Champlain Dragon Boat Festival. This year’s featured artist is Nancy Stalnaker. Having grown up in Connecticut painting alongside her mom, Nancy Stalnaker has been a New England artist her whole life. Though being surrounded by a family full of talented artists of many media and completing a minor concentration in Fine Arts at Syracuse University in 1976, she considers herself to be largely self-taught in studio arts. In 2010 Nancy returned to watercolor painting after work and family commitments had sidelined her creative activities for many years. She now happily advances her artwork by painting her favorite land and waterscapes full-time in her studio at The Green House in Burlington’s south end. 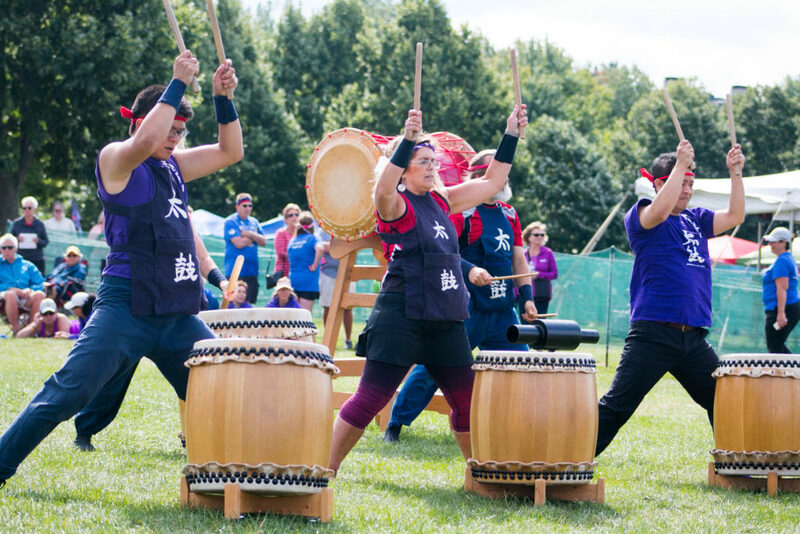 Racers and spectators alike can find a variety of entertainment throughout the day at various places around the festival grounds. Our entertainers are known throughout the area and region. Take a look at our 2018 entertainment list below and check back as we get closer to the 2019 Festival to see this year’s entertainment.